At the top of the women’s soccer team’s formation, wearing highlighter-yellow cleats, Jasmin Dhanda waits for the ball patiently. She isn’t loud or demanding, but quiet and composed as the point woman of UBC’s offence. Monitoring along the University of Victoria Vikes' defensive line, she is constantly watching — waiting for her moment. It’s midway through the first half and UBC is up 1-0 against the University of Victoria. Dhanda has yet to strike, but she doesn't doubt herself. She has a point in all but three matches so far this season. As has come to be expected, she capitalizes in the 30th minute. As third-year midfielder Reetu Johal looks up for an open teammate, Dhanda circles around into position between the Vikes' defence. Johal sends the ball into the empty space behind Victoria's back line and Dhanda strides into its path, just ahead of a defender coming to challenge her. Inside the box, Dhanda tips the ball over the sprawling Victoria keeper — it’s a tough shot to make, but Dhanda sinks it effortlessly. The ball ripples the back netting and Dhanda calmly celebrates with the wave of teammates flooding in her direction. She isn’t attention seeking. She doesn’t embellish anything. Just another shot, another goal and another 60 minutes left to play. 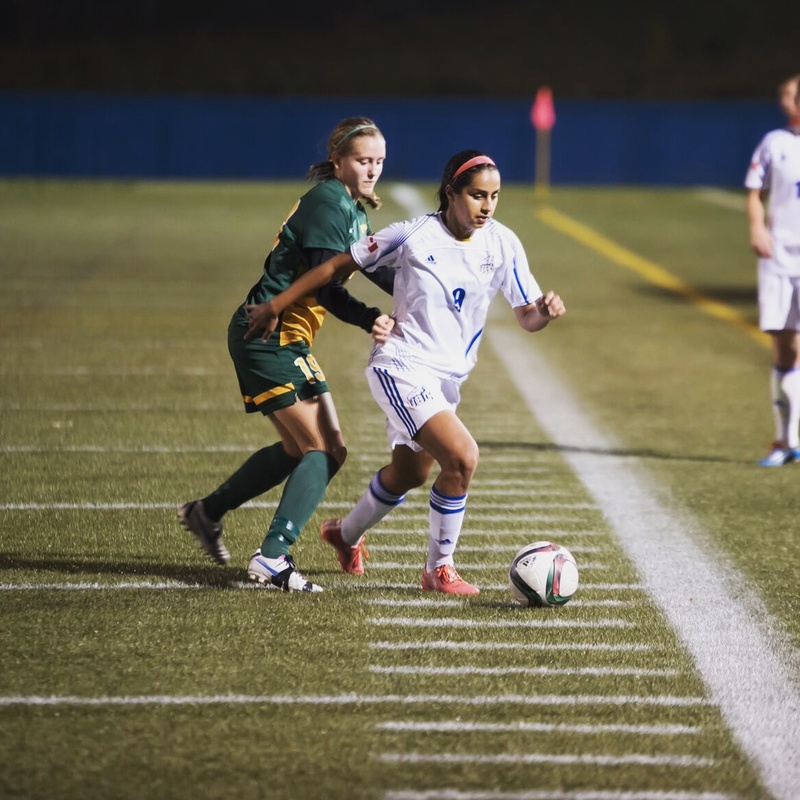 Now in her fourth year with the women’s soccer team, Jasmin Dhanda is an essential part of the ’Birds offence. With two games left in regular season, she sits on ten goals and eight assists, and leads the team in goals, assists and shots. 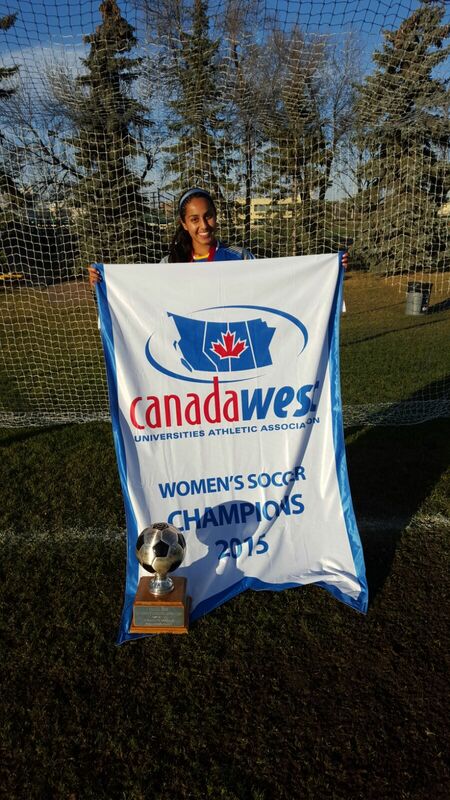 Dhanda’s success with UBC doesn’t come as a surprise when you look at her soccer history. Her career so far includes stints with the national training centre, the U-17 national team and time with the Whitecaps residency program. But it’s her collected, calm demeanor that puts her in a league of her own. And it doesn’t come unwarranted, given her history with the game. Her love for soccer started in her childhood, as it usually does. Playing soccer with her brother and sister at a young age, Dhanda said her parents spotted her talent early. Though she played other sports like field hockey, by 14 she had realized soccer was the sport for her. Since then, she has continued to gain recognition for her skill, highlighted most recently by a Gunn Baldursson Memorial Award for being the most valuable player at the 2015 National Championship. With that kind of a history, Dhanda says she’s gained an unfaltering level of confidence. But that confidence doesn’t come without knowing there is some expectation to perform as well. 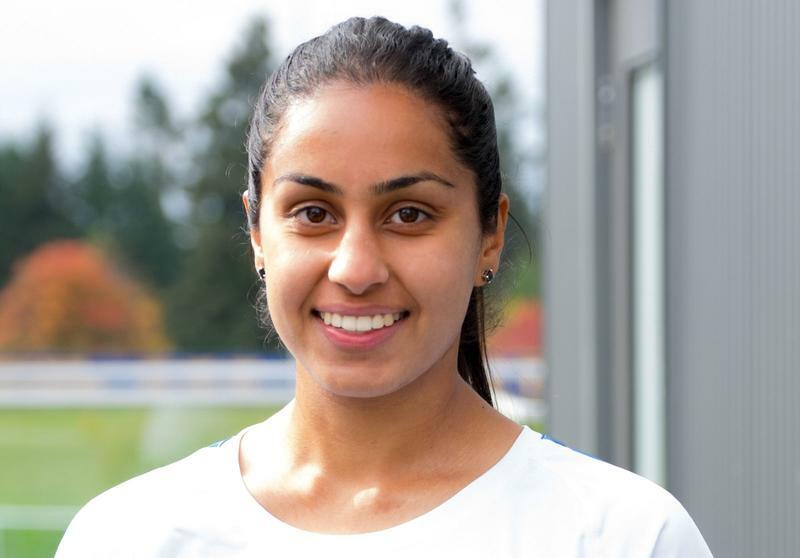 Head coach Jesse Symons has seen this confidence grow first hand, having coached Dhanda not only here at UBC, but with the Whitecaps residency program as well. “I think the one thing that all great players have is that they aren’t cocky or flamboyant … they are just within themselves and they are quietly confident,” said Symons. “Jasmin’s always been like that — she’s never been a player that has needed attention or needed that arm around her to say you’re good. She’s just confident. As for what he’s seen change in Dhanda over the years, Symons honed in on her maturity as a leader and its parallel with her surety on the field. So she can score and she does that on a consistent basis. But she also knows when to give that space to another player, or to set up someone else up going forward. She is a game changer, but a playmaker too — an essential piece of the puzzle as it stands today for the Thunderbirds team. She has the skills, the determination, the certainty and the demeanor to lead and succeed, and she’s been doing that. What’s more, UBC gets another season with her in their uniform. “You look at all the attention she’s gotten this year, to know that she’s got another year at this school is really exciting, to see what she’s going to be able to bring,” said Symons. Calm, collected, and confident — Dhanda is triple threat up front for the women’s soccer team and she has another season left to impress.